The Badminton World Federation (BWF) and Badminton Asia created history by joining forces to hold the first ever BWF Level 3 Coaching Course in Cyberjaya, Malaysia from June 26-30. On hand to conduct the course were "experts" in their in their respective fields - BWF Development Director Ian Wright and BWF Education Resources manager Dr. Sharon Springer. The duo highlighted the coaching framework of a player's development pathway programming of what they are, and why it is vital to one's coaches knowledge and its system. Two other "experts" in the field of mentoring and delivering the course on such topics - Dr. Kenneth Larsen (Denmark) and Martin Andrews from England - delivered their expert knowledge at the pilot project in Cyberjaya. Dr. Kenneth Larsen and Martin Andrews touched on how to intrinsically motivate players in an elite level and engage in effective interaction in communicating with athletes during practice sessions or in competitions. Those who attended the "historic" BWF Coach Education Level 3 came from different countries in Asia and Oceania. The week of unique learning saw 16 participants - two each from Lebanon, Singapore, and Malaysia and one each from Bahrain, Iran, Bangladesh, Philippines, Sri Lanka, Jordan, Syria. Kazakhstan, and Indonesia. 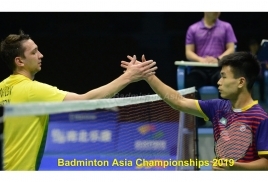 With the game developing at a rapid pace in the Asian continent - thanks to Badminton Asia's aggressive development programs to develop the shuttle sport in Asian countries - the Asian body was well represented in Cyberjaya. Badminton Asia's Development Manager Thana Arikrishnan led the team which included Development Executives Muhammad Andy Ardiansyah and S. Sambenthan. The BWF Coach Education Level 3 is part of the coach development of BWF and Badminton Asia. Badminton Asia's Chief Operating Officer Mr. Kenny Goh and Badminton Asia's general secretary Mr. Greg Kim, who paid a visit to the course, conveyed their "gratitude and appreciation" to BWF and the organizers and the participants for their commitment to the sport of badminton. "The BWF Level 3 Coach Education Level 3 is a first in the world and Badminton Asia is proud to be part of the badminton history," said Kenny Goh.